Tumeric Root Capsules - 700 mg, 60 Vcaps™ (Curcuma longa) - Penn Herb Co. Ltd. Note: this product is not available. Please see suggestions below for alternate products. The aromatic spice that gives curry its golden color is one of the most recommended herbs for joint comfort as well as supporting healthy liver function. 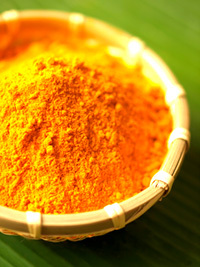 As a member of the Ginger family, Turmeric too relieves digestive discomforts and helps the body digest fat & protein. Why not add the spicy powerhouse to your daily routine with our high potency whole herb capsules? Common Names: Curcuma, Tumeric, Haridra, Indian Saffron, Jiang Huang, Kyoo. Promotes joint comfort & flexibility; herbal antioxidant; liver tonic (provides similar protective benefits of Milk Thistle & Artichoke; supports healthy gallbladder function; promotes healthy digestion; alleviates gas & bloating. Promotes circulation; traditional Ayurvedic blood purifier; skin health, promotes blemish-free complexion (skin mask); culinary spice. As an addition to the diet, take 1 or 2 capsules three times daily with water at mealtime. NOT TO BE USED DURING PREGNANCY OR BY PERSONS WITH BILE DUCT OBSTRUCTION AND GALL STONES.